I’m fairly sure there are very few Irish, Togolese and Zimbabwean trios making music today, and while there’s a lot more to Rusangano Family than their nationalities, it sure is a fascinating starting point. Rapper MuRli, MC God Knows and producer mynameisjOhn are creating some of the most arresting and direct music around. Think of Sleaford Mods’ minimalism and ear for tasty loops, minus the bilious world-view, and you’re halfway into what makes their sound so great. The other two parts of Rusangano Family’s secret recipe is their enthusastic live show – they are essentially a band with three hype-men, and crowds react accordingly – and their fascinating, important, excitable songs. New song Heathrow is timely, describing the feelings of arriving migrants in Western Europe. It’s powerful where in other hands it could be pious. It’s thoughtful but rollicking fun. It’s hard to be fun and important at the same time – these are notoriously uneasy bedfellows. 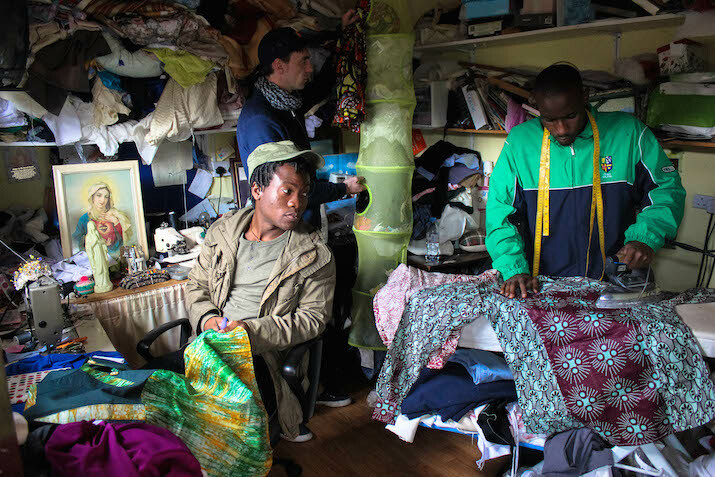 But Rusangano Family know all about squeezing seemingly conflicting styles, stories and backgrounds together – it’s pretty much their raison d’etre – so of course they can pull it off with panache. Awesome. Watch out for them. Posted on November 14, 2015 by Joe Sparrow. This entry was posted in "Brilliant" Bands, Today's New Band. Bookmark the permalink.